I wanted to write this for the benefit of Raspberry Pi owners who are still looking for an appropriate and economical Wi-Fi adapter. The cheapest one I could find is based on the Realtek 8188CUS Chipset. There are a number of devices that use this chipset. 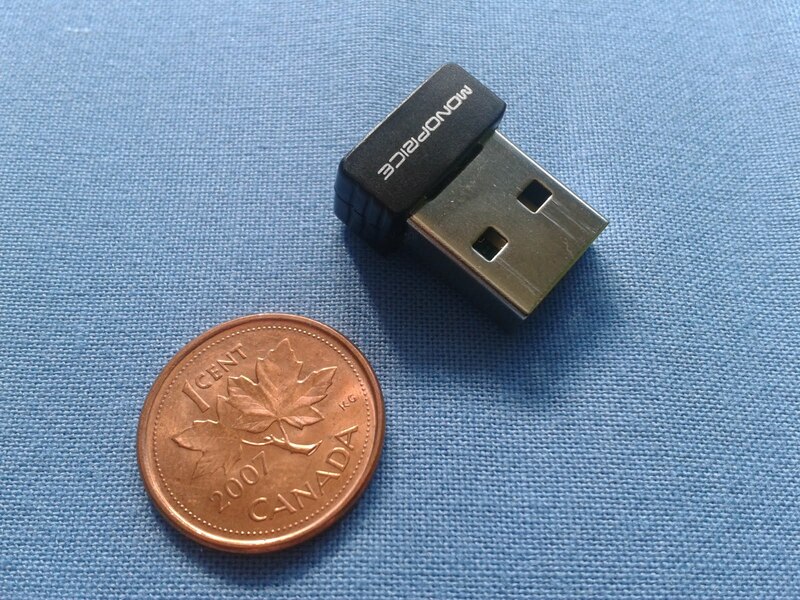 The cheapest as of writing this entry is $5.05 US, the SANOXY Mini 150M USB2.0 WiFi Wireless LAN 802.11 n/g/b Adapter. The one I have I got from monoprice.com is the Ultra-Mini USB Wireless Lan 802.11N Adapter - 1T1R (150Mbps). To give you a idea of how tiny it is, here is a picture next to a penny. There are two issues with these Wi-Fi adapters. First, the RTL8188CUS driver that comes with the official Raspberry Pi image does not work. You will need to install the driver manually. There are a number of users who have already written excellent how-to's to accomplish this. After you have the driver compiled and working, the Debian wiki has some great info on how to get it up and running. The second issue is with power. Sometimes the adapter will stop working (especially when transmitting). To solve this issue you can either use a powered USB hub or try a hack to boost the current provided to the USB ports on the Raspberry Pi. I have not been able to get the Monoprice to work yet for me. I would sure like to see a copy of file you have on your RPi.